If you have a Current Cost LCD Energy Monitor and are looking for free home electricity and solar monitoring software apps, to run on Windows OS, then we would suggest you take a look at our updated SOFTWARE page. On the other hand if you are looking for the same to run on Linux, Raspberri Pi or MAC then our LINKS page would be the better solution. Where we highlight more complex / developer electricity monitoring software applications. Also on our website is a FREE ONLINE ENERGY MONITORING DASHBOARD, where you can track your total electricity consumption, solar generated power and household appliances, all easily from anywhere on any device. Now of course there is less of an excuse to not be monitoring your consumption or solar generated power. Remember this you can only increase your energy savings, when adding an energy monitoring solution to your home. Finally giving you the feedback you have not had up to now! The Current Cost multi-channel LCD Energy Monitor is not available anymore in Australia. We aim to keep the software apps for this great monitor on the SOFTWARE and LINKS pages. 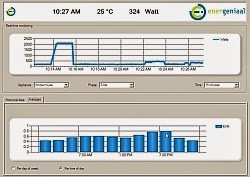 The trend now in energy monitoring is to place energy data online via an Energy Monitoring Dashboard. Where features and benefits are easily added almost overnight. Far out winning the issue where energy monitors could only be upgraded by a change of firmware or redesign. HOW TO CHOOSE YOUR ENERGY MONITORING SOLUTION. This post updated October 2016. Brought to you by Aussie Home Energy, a major player in the HOME ELECTRICITY REDUCTION SERVICE industry in Australia.